I’ve had my eye on Union Hill (W7W/KG-142) for the entire 9 months I’ve been activating SOTA summits. Why, you ask? Several reasons. First, it is the closest summit to my QTH. Secondly, the summit is on a piece of undeveloped forest that invites exploration. And if those reasons are not enough, the summit had never been activated. The catch is that the property owner has unambiguously marked the property with plenty of no trespassing signs, so it felt like a stalemate. I recently came across a report from a peakbagger who wrote to the landowner and received permission to hike to the summit. I figured I would drop the fellow a letter one of these days—you know, when I was all caught up with that pile of bureau QSL cards to return…. 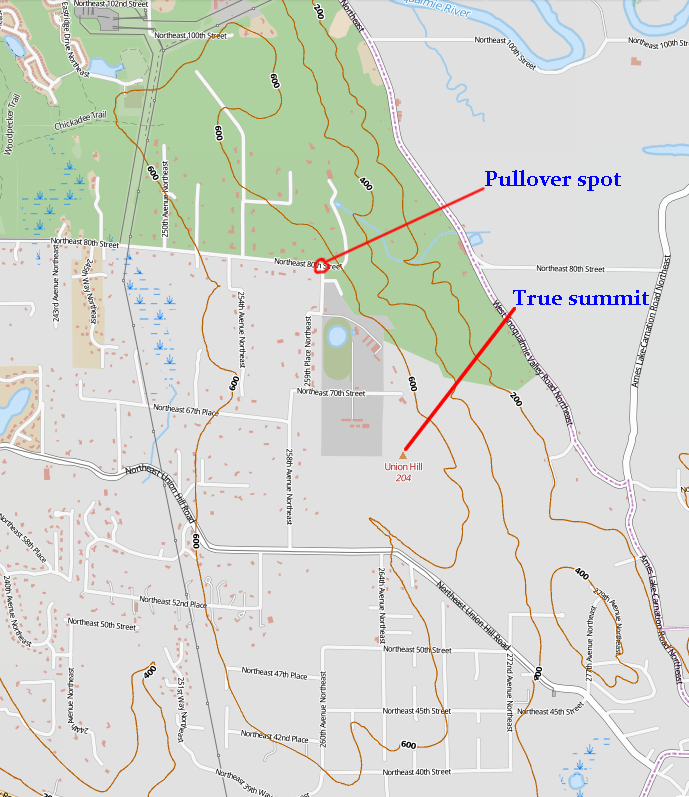 A few days ago, I was thinking about quick summits, and I decided to take a careful look at the activation zone for Union Hill. And what a surprise I got. The summit elevation is 204m, or 669 feet, and so the SOTA activation zone is the isoline at 174m, or 571 feet. I pulled up a topographic map on the screen with 600′ isolines. And what to my wondering eyes did I trace, but a gigantic blob some 5 miles north to south and a couple of miles east to west. Union Hill has something like 10 square miles of activation zone. An overview of Union Hill W7W/KG-142, with most of the activation zone shown as the area within the 600′ isoline (click for larger image). The other interesting thing is that I’ve operated from within the activation zone from three different spots without realizing it. The first spot is a little pull-over at 47.6734286, -121.9922197 (625′). I’ve used this spot many times during VHF or UHF contests to activate CN97 close to my QTH. The second place I’ve operated from is the QTH of Grant, KZ1W, who lives a few blocks away in CN87. He has let me sit in his driveway during VHF+ contests as a quick way to activate CN87 (and his QTH is some 250′ higher than my QTH). And last year for field day, the Redmond Radio Club camped in the yard of Bob, AE7FN, for the event. And Bob lives in the activation zone. This year, the Redmond Radio Club will do field day at the QTH of Dave, W7CF, who not only lives in the activation zone, but his back yard abuts the property with the true summit. So that is the background. A couple days after realizing all this, I got an email from Grant in need of some labor with a new tower installation. I threw my SOTA pack into the car and headed over. After an hour of helping to move a series of 500 lb external ring rotor assemblies, I unpacked the radios on a tree-stump in his wooded back-yard and strung a long wire antenna through some trees. After a few calls, N4EX came back to my CQs on 21 MHz. VE2JCW was next with a booming signal. Next up was N7UN, followed by EA2LU who was having great difficulties hearing me until I cranked the power to 70w from the FT-857. Then I moved to 18 MHz and worked a number of other folks to round out to a total of 9 QSOs. Getting there: The activation zone can be reached by car or bicycle from almost any direction. If you are looking for a hike with some elevation gain, the shortest approach is from the southeast, starting at one of the many parks near the Snoqualmie River. Starting in Carnation would provide a 500+ feet of gain. Another hiking possibility would be from the north, perhaps beginning at the Redmond Watershed Preserve along Novelty Hill Road. If you want to start in Redmond, be prepared for a long hike either following Novelty Hill Road or Union Hill Road. If you do drive there, be aware that there are very few unobtrusive places to park a car within the activation zone that I have been able to find, except at 47.6734286, -121.9922197. One possibility is to park along the road just south of the intersection of Northeast 80th St, Redmond Ridge Dr Northeast, and 238th Ave. Northeast (47.6749818, -122.0220780, green circle on the map below). A series of trails begin at the NE corner of this intersection. Follow the Woodpecker Trail to the Chickadee Trail until you reach the power line trail (highlighted in red). Activate here, or continue a short distance on the other side of the power line cut. The elevation gain is only about 50′. Parking area (green circle) and hiking path (red) into the activation zone (click for larger image). Union Hill is an atypical summit, in that the activation zone covers a huge area that spans dense suburbs to narrow, rural roads. If you are in the vicinity of Redmond, Washington, it’s an easy activation by bicycle, hiking or even as a “drive-up” summit.